Most Sankey diagrams I find on the web are from Germany, Switzerland or Austria. Anybody in the know, if this due to the visualization type being part of the engineering curriculae in these countries? Here is one I found on ‘The Wood Power Plant’ blog by Austrian firm Syntec. It is originally taken from a student master thesis on ‘Life Cycle Analysis of Electricity and Heat Generation of a Wood Gasification Plant including District Heating Network’ (German title: ‘Lebenszyklusanalyse der Strom- und Wärmeerzeugung einer Holzvergasungsanlage inklusive Nahwärmenetz’, thanks Google Translate – you are my friend!) by Elena Käppler of University of Applied Sciences Vorarlberg. While being graphically quite appealing there are some issue with this Sankey diagram. Flows don’t seem to add up correctly: for example the main stream 4.838 MWh and the 401 MWh coming in at the top would be larger than 5.171 MWh. Also, some flows are not true to scale. Check out the red arrow representing 247 MWh (going down to ‘Verteilungsverluste’) and compare it to the red one going back in a loop, which represents 419 MWh (‘Hackguttrocknung’). As part of the Canadian SPRUCE-UP research project one activity is dedicated to Genomic, Ethical, Environmental, Economic, Legal or Social (GE³LS) aspects of this applied genomics project. As part of their work the scientists have developed the Canadian Forest Service – Fiber Cascade Model (CFS-FCM) simulation model. 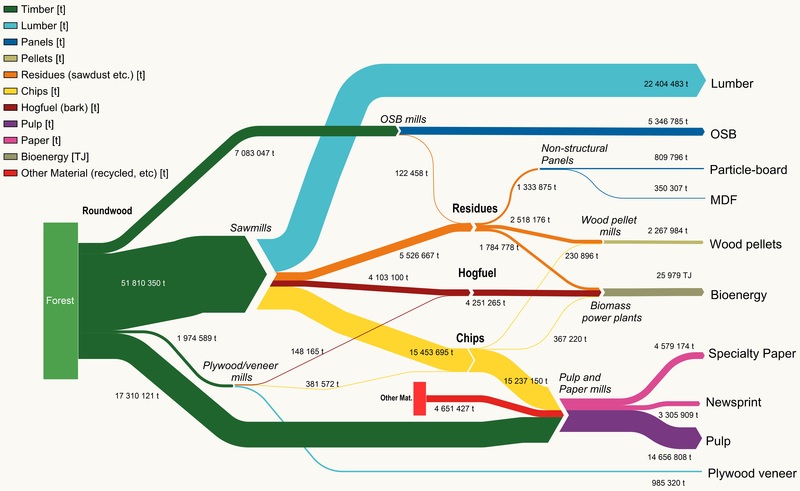 This Sankey diagram shows one specific scenario for a downstream flow of wood fibre from Canadian forests to products. Flows are in metric tonnes (probably for one reference year), with the exception of the ‘Bioenergy’ flow, shown in terajoules (TJ). 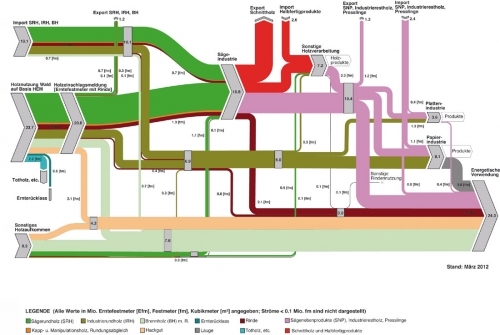 A beautifully crafted Sankey diagram on wood in Austria can be found in the 2012 article ‘Die Bedeutung von Holz als erneuerbarer Energieträger’ (translation: ‘The importance of wood as a renewable energy source’) by Kasimir Nemestóthy on the waldwissen.net website. These are the wood streams in Austria in 2010. All streams in solid cubic metre of wood (“Festmeter”, fm). Smaller streams less than 0.1 mio solid cubic metres are not displayed. Here is how the diagram is structured: on the left the sources of wood with imports, harvesting from forests and other non-forest wood sources. Imports and harvested wood is directed mainly to sawmills (“Sägeindustrie”) and to paper industry. Non-forest wood as well as losses from wood industry (bark, wood chips) are for energetic use. The dark green arrow is saw round wood with the bordeaux-colored stream representing bark. The brown arrow is industrial round wood of lesser quality, mainly used in paper industry. The light pink and light green arrows represent wood chips and firewood. Along with remains from the saw mills and paper industry it is destined for energetic use. One minor design flaw at the top (arrow from imports to saw mills) where the green arrow overlaps the orange and red arrow in the curve), but by the untrained Sankey eye this will probably rarely be noticed. There is a second Sankey diagram in the article that details the energy use, but I will save that one for a separate post. 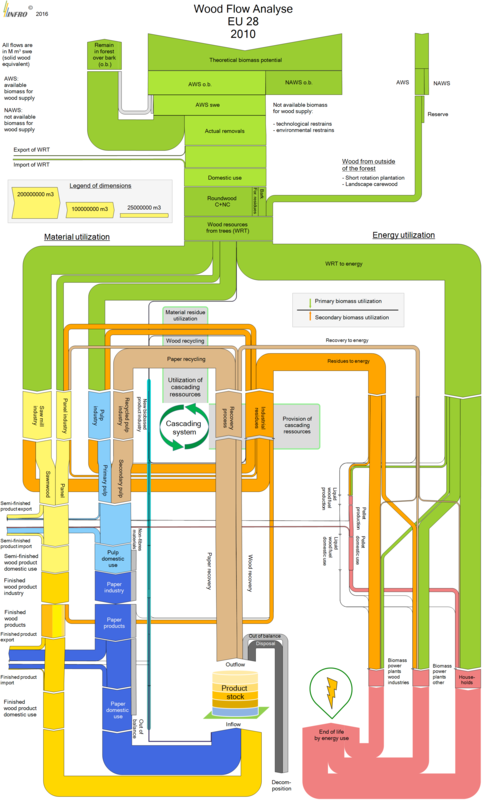 From a presentation by Swiss company CTU Clean Technology Universe AG comes this Sankey diagram for energy flows in a wood gas process. The diagram is set up for wood with 50% humidity and an energy content of 1 MJ. 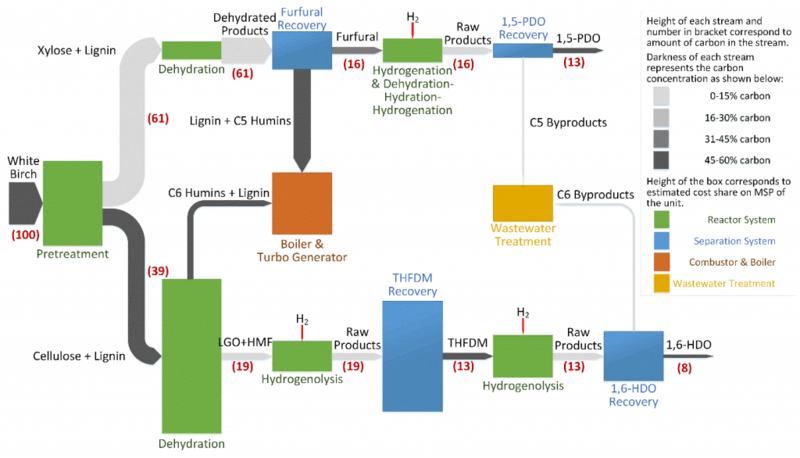 The process steps drying, gasification, methanation, CO2 removal yield gas with an energy content of 0,71 MJ (71%). Much of the offheat is recovered in the process, excess heat is fed to district heating. Wood in brown, gas in orange, heat in red and electricity in blue. Another Sankey diagram for wood gas here. Nicely made infographic from steelconstruction.info wiki. What happens to the building materials on demolition, how much of concrete, timber and steel can be recycled? The three arrows are curved and start at a 7-o’clock position. Used concrete from building demolition is mostly downcycled. Wood from structural frames is mostly landfilled, or re-used. Steel has a very good recyclability and most of the material can be recovered to make new steel. The view angle and the images of construction machines make it a very attractive infographic.